FILE - Medicine supplies stacked in containers are seen after shipments to North Korea were delayed at a port in Pyeongtaek, South Korea, Feb. 25, 2016, in this photo released by the Eugene Bell Foundation. A humanitarian organization that treats deadly multidrug-resistant tuberculosis in North Korea is being impeded by delays because of heighten inter-Korean tensions and sanctions imposed on the Kim Jong Un government for its ongoing nuclear and ballistic missile development programs. In addition to the two rounds of United Nations sanctions imposed on North Korea this year, South Korea issued tougher unilateral sanctions in March, blocking virtually all shipments to the North, with no exception made for humanitarian assistance. Seoul also cut off all lines of communication with Pyongyang earlier in the year. 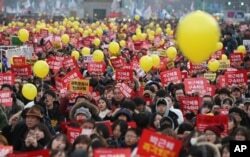 Protesters shout slogans during a rally against the impeached South Korean President Park Geun-hye in downtown Seoul, South Korea, Dec. 17, 2016. Since then the Eugene Bell Foundation, an American nongovernmental health care aid organization based in Seoul, has encountered difficulties getting South Korean government approvals and export licenses to send medicine and supplies into the North. In March, the organization was able to send tuberculosis medication and supplies to treat 1,500 patients in North Korea, after waiting weeks for authorization from Seoul. While South Korea has not formally banned humanitarian aid to the North that is intended for young children and pregnant women, it has scrutinized and granted approvals on an individual basis, slowing the process. After appealing to South Korean authorities, Stephen Linton, the president of the Eugene Bell Foundation, thought an agreement was reached in August to allow his organization to continue its operation in the North. But the organization’s latest request to ship medical supplies in 2017 has again been put on hold by the Ministry of Unification in Seoul. “I asked, ‘What about the promise you made in August?’ They said, ‘You better ask Kim Jong Un about it,’” Linton said. According to the World Health Organization, the mortality rate from tuberculosis in North Korea was 20 deaths for every 100,000 people in the population in 2014. The Eugene Bell Foundation focuses on treating multidrug-resistant tuberculosis, a more deadly form of the contagious bacterial infection that does not respond to standard TB drugs. The cost of multidrug-resistant TB treatment is also 100 times more expensive. The American nongovernmental organization is funded by private donations from mostly South Koreans and Korean Americans. Linton has called the outbreak of the multidrug-resistant strain of the disease in North Korea an epidemic, and he estimates that 4,000 to 5,000 people are infected every year. His organization operates 12 treatment centers in the country, and in 2015 treated 1,000 new patients. This year they have been able reach only half that number. Delaying and blocking the aid group from providing treatment, Linton says, will allow the disease to spread more rapidly. 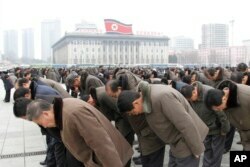 People bow to portraits of the late leaders, Kim Il Sung and Kim Jong Il, at the Kim Il Sung Square in Pyongyang, North Korea, Dec. 17, 2016, to mark the fifth anniversary of Kim Jong Il's death. In April, Pyongyang also suddenly postponed a visit from a Eugene Bell delegation for two months without providing any explanation. “It was a medical disaster. I wasn’t sure if it was due to North Korea blocking access to foreigners due to tensions with South Korea, but our delegation’s visit was delayed,” Linton said. Fortunately, he said, the current TB patients had sufficient medications to continue their treatment. Any interruption in treatment allows the disease to develop a stronger resistance to the drugs. The delay also meant the group could not treat any new patients during that period. Pyongyang has reacted defiantly to the UN sanctions imposed this year, by accelerating its weapons development efforts, conducting 20 missiles tests and an unprecedented second nuclear test in one year.